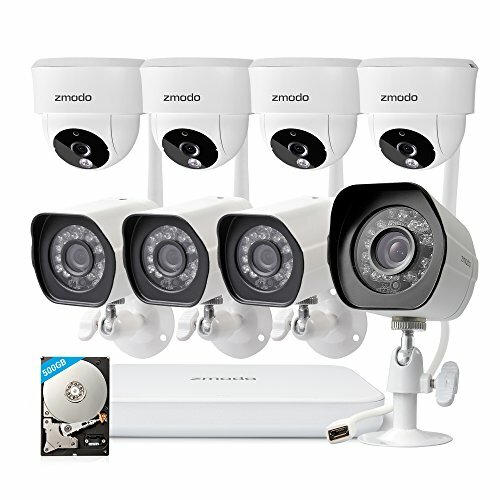 【Complete Camera Solution】: Watch your home day and night in crisp 720p HD with the indoor and outdoor cameras. The indoor cameras have 115° wide viewing angle and 90° adjustable lenses, which covers all corners of your house. The outdoor cameras enable you to see your home 24⁄7, rain or shine. 【Remote & Local Playback】: Cameras are built with excellent quality for 24⁄7 HD monitoring jobs, and video feed is saved to the included 500GB hard disk. Watch the playback either locally on your monitors, or remotely on your phones through Zmodo app.